It’s been a while. Lot of things happened. I am happy to say that I’m back in EVE, roaming the New Eden skies once again, like a free capsuleer, thank God, feels so good to experience all that new stuff! This time I got a little present for all of you, Clone Mercenaries out there. No need of fancy announcements, just take a look. What you’re looking at right now is called Gravimagnetic Plasma Rifle, but I really like to call it “Blast Rifle” because I have a blast every time I shoot with the prototype. It is designed to be a tactical anti-infantry weapon and it is even capable to fire at multiple targets at once. The Blast Rifle is a light weapon that fires powerful plasma blasts and using a special gravity field, combined with a magnetic field, it is also capable to make these blasts push the enemies, compromise their aim or knock them down. The “heart” of this weapon is the Core Accelerator Battery. This special device greatly improves the effectiveness of the weapon’s plasma ammunitions making every blast powerful enough to cause some serious damage even against heavy frame dropsuits. It is like a tiny capacitor that collects energy from the surrounding environment and uses it to make the particles in the plasma shells gain more power, while keeping them in a stable state until the moment of fire. The battery itself can operate for more than a month of intensive use before it needs to be replaced. Right next to the battery there is a slot for modifications. Various devices can be put there making it possible to modify the power of the weapon, its range, accuracy and so on. I will update this post with some info about them when I have time. The weapon uses a launch system that has a rather large body for a rifle. Well’ I have played around with the balance and it should not be a problem. The launch system is supported by a cooling system that requires the weapon to slide open its sides and “exhale the steam”. It is constructed this way because good pressurization is needed when firing. Another segment that I want you to pay attention to - the Field Emitters. These devices are connected to the Core Accelerator Battery and it actually provides the energy for them so they can emit the special Gravimagnetic Field of the rifle. The weapon can be equipped with a scope, providing good tactical advantages on the battlefield. When the soldier holds down the trigger, the weapon activates the Gravimagnetic Field, which is projected forward in a conical area. For a very short time this field reaches its maximum range and in the meantime the plasmatic blast is being charged. The most powerful charge reaches its top for up to 1.5 seconds and the weapon will shoot with its full might upon trigger release. The plasma blasts actually form a sphere of plasma, like a “ball of water” that would sprinkle all over the targeted soldier. With the help of the field this plasma sphere will hit the enemy and what’s left of it will get back together and continue forward, as long as it is in the field. Actually the plasmatic sphere blazes around the target, damages it and then keeps flying forward, damaging other targets in its path until it run out of plasma, hit a solid surface or disperse outside the field. As long as targets are in the conical field of the rifle, there will be a good chance for the plasma sphere to hit them, even if they are not in a straight line. The field itself has both gravity and magnetic nature, making the plasma spheres (blasts) able to be “contagious” so that they jump from one target to another, as long as they’re in the field and therefore there is not an obligatory rule for the targets to be in a staight line. There are three levels of power depending on how long the trigger is being held. Level 1 requires one round of ammunition and provides a blast that can get through two or three soldiers and it may compromise their aim or push them out of balance (random chance). Charges for 0.5 seconds. Level 2 requires two rounds and fires a blast that is more powerful. It can pass through five or more soldiers and will always knock the closest ones back. Charges for 1 second. Level 3 uses three rounds and fires the most powerful blast, capable to damage up to 8-9 soldiers in a line, knock the closest ones down and knock the rest back. Charges for 1.5 seconds. The time for charging each level is conceptual of course. Tests show that it can be much shorter. Using the weapon this way may bring good tactical advantages since it not only damages the enemies, but also pushes them, making them temporarily ineffective on the battlefield so that the soldiers with Blast Rifles and their allies may dominate in a given situation. There is no guarantee that the plasmatic sphere will damage the closest target the most and be less effective with every next target in its way. Yes, this is what usually happens during the tests, but there is a sufficient percent of shots that damage targets that are further in the plasmatic sphere path. Factors like targeted soldiers movement speed, their equipment and their position – they influence the plasmatic sphere effectiveness. Weather conditions may also have their influence in some specific situations. Alternatively you may choose to just tap the trigger and fire plasma blasts without using the special field. 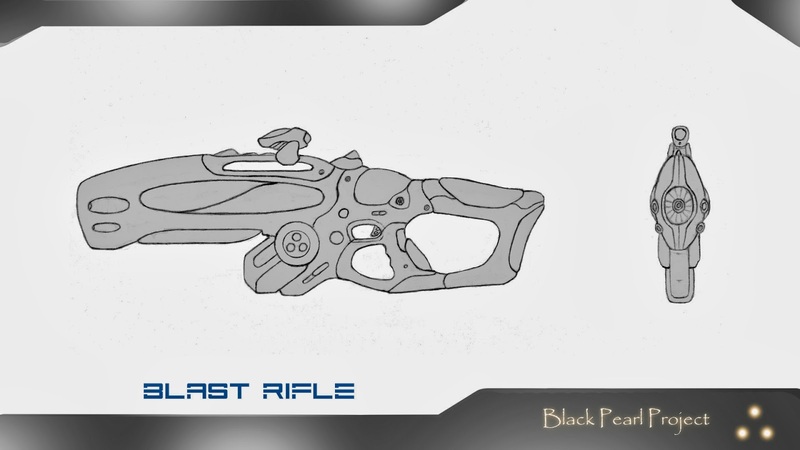 When used this way the Blast Rifle will have a rate of fire of one shot each 0.2 seconds. A well placed shot will compromise the targeted soldier’s aim. The damage will not be as good as if you were holding the trigger, but it will be enough. The standard clip size is 12 rounds. This concludes the brief presentation of the Gravimagnetig Plasma Rifle or if you prefer – Blast Rifle. This type of special tactical weapon will provide Clone Mercenaries with the freedom to be way too deadly and effective on the battlefield, if they learn to use it well, of course. Its development is in the Prototype stage. I hope you enjoyed this article. What I really want is to see a rifle like this in DUST 514. This is my way to contribute for the further development of the EVE Online universe. I really want to leave this concept in the hands of the skilled Art teams and Game Design teams of CCP. This is the Blast Rifle. If you want to have it in your hands and play with it, then please show your support by sharing this article, discuss and criticize it in the comments, suggest improvements, spread the love.